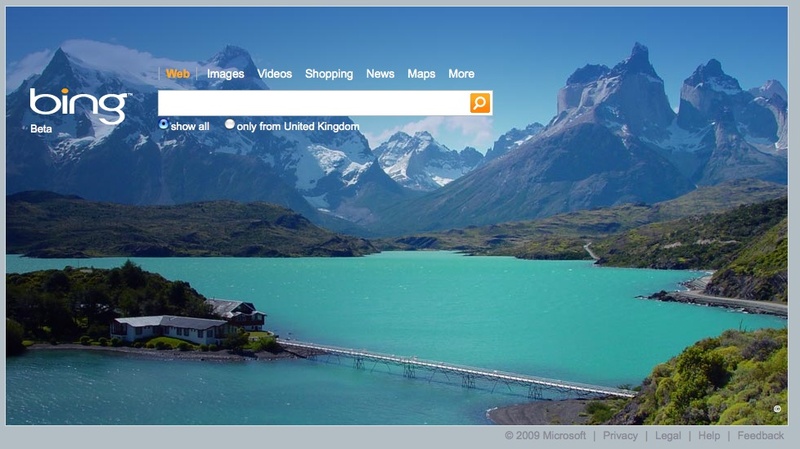 Home > Online & Search Issues	> But it’s not google – Bing goes Live! 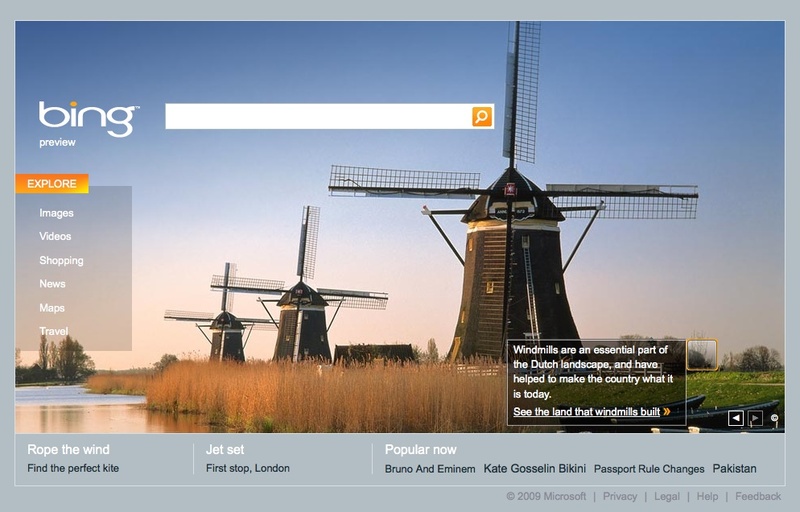 But it’s not google – Bing goes Live! Another long wait between entries – I really must update more often. However recent events in the Search world and in the CI world mean I have no choice but to update. My thoughts on recent changes at SCIP will have to wait till my next post. This post will look at Microsoft‘s replacement for Live and MSN Search – with its new Bing search engine. Searches at Live or MSN Search now redirect to Bing.com. I like the front-end – it’s clean and colourful. However I couldn’t find anywhere to change the front image – at least on the UK version that’s still in Beta. The US version does allow you to scroll back to previous images – with a little arrow option at the bottom of the right side of the screen. The US version also includes hot-spots describing aspects of the picture, plus a side-bar offering more search options. At the bottom of both versions is a link for help – interestingly still pointing to Live.com. Obviously Microsoft still has more work to do on this. The help section gives the format for advanced commands and also allows you to remove the screen background. This title doesn’t exist on our web-site so has been taken from somewhere else – most likely from a link on a UK government business support web-site. Where Bing falls is in the advanced searching and also the preferences. I like that you can set Google to display 100 hits at a time. Bing only allows 50. Bing also lacks some of the field / advanced search options available to Google. There are no wild-card searches (using the * character) or synonym searches (the ~ character) for example. However there are options that are not currently available in Google – such as the feed:, hasfeed:, loc:, and contains: options. These allow for searching for RSS sites (feed: and hasfeed:), location searches (loc:), searches for sites containing links to types of content such as WMA, MPG files, etc. – contains:. These options are not available in the advanced search boxes. All in all – i like Bing and prefer its interface to Live. I like colourful pages, and have customised my Google page with iGoogle themes, and Ask with it’s skins. Yet again, however, this is not a Google Killer – and perhaps it’s not trying to be. The key thing: Bing is not google! WolframAlpha Cuil – not going to cull Google!